A while ago, I had a post on using XTF’s ETF Finder to find ETFs that belong to the same sector. I like that tool because it allows me to see all the competitors of a particular fund and gives me all the information I need on one page. Recently (less than two months actually), XTF, an investment firm that specializes in exchange traded funds (ETFs) investing, introduced another service, ETF Rating to help investors get a comprehensive view of a fund. 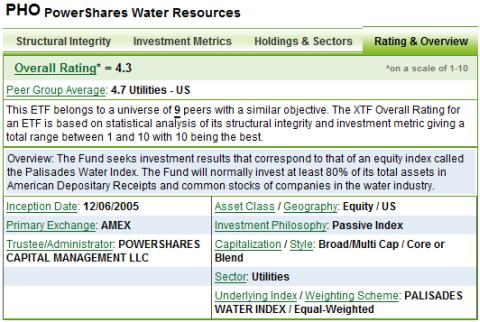 The following is the screenshot of PowerShares Water ETF PHO. XTF’s ETF rating consists of two parts: the structural integrity and investment metrics. According to XTF, the structural integrity measures the fund manager’s ability to mimic the fund’s underlying index. Though from a fund’s prospectus investors have the information about the fund’s correlation with the index it tracks, errors still exist and from time to time, the fund’s investment could drift aways from its underlying index. XFT’s structural integrity rating considers a ETF’s tracking error, expense ratio (ER), bid/ask ratio, market impact, concentration risk, efficiency and capital gains distributions to give a fund a score on a scale of 1 to 10. The investment metrics rating looks at the fund’s long term investment performance by evaluating its yield, risk, and historical performance. This part of the information may not be particularly helpful right now because most of the ETFs have very short history and the longest history is likely to be only one year or less. Thus the rating could be skewed by short-term fluctuation. Combining the two ratings together, XTF will also assign an overall score to the ETF which is used to compares the fund to its peers, as shown in the picture below. Though the summary mentions that PHO belongs to a group of 9 funds with similar objective, exactly what those 8 funds are couldn’t be found from the rating page. Such information, however, could be very helpful for investors to select which fund to invest in. Overall, I feel it’s a quite convenient tool to research EFTs. Basic information of a fund is presented in a way that I can easily find out what I want to know about the fund. Some of the information such as bid/ask ratio, tracking error and efficiency is not available at other ETF research sites such ETFConnect.com and Morningstar.com, making XTF quite unique.